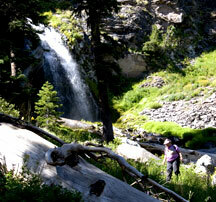 Plaikni Falls – Crater Lake National Park - Explore! 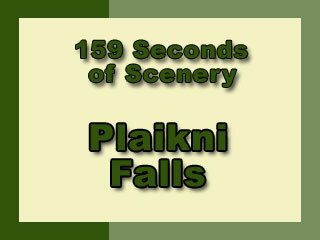 Plaikni Falls – Crater Lake National Park - Explore! New Plaikni Falls Trail . . . 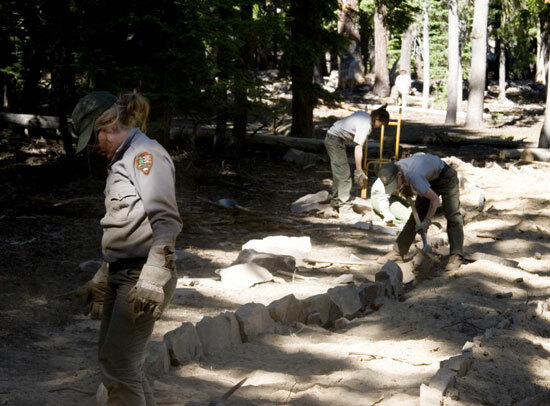 The news is that, as of this moment, the new Plaikni Falls Trail in Crater Lake National Park is well underway. A Park Service crew, shown above, is cutting and setting curbs, leveling and backfilling with gravel from a nearby quarry. This ’causeway’ type of construction will have a raised bed. This will make a first class trail that should hold up for centuries. On August 14, 2010, the crews still had a long way to go. They are working from a base area off of the Pinnacles Road. The new trail head parking area is almost done, but closed to vehicles. We drove into the base area on an old forest road just down from the new trail head. This is the road the workers use to access the trail. The trail itself is intended to provide day-use access to the waterfall for people with limited mobility (it will be wheelchair accessible over compacted gravel with grades less than 5%) and to encourage visitors to see more of the park than Rim Village. It adds an attraction to people using the nearby Lost Creek Campground or visiting the Pinnacles overlook at the end of the Pinnacles Road. The original trail began on the old road (also known as Anderson Bluff Trail) that we entered on and the new trail extends westward from that road to the Pinnacles Road, thus extending the length of the trail by 1/3 mile. Still, it will be only about a mile from the Pinnacles Road to the waterfall. The old trail was little used and sometimes hard to find after it left the Anderson Bluff Trail. The new trail will be extremely easy to find and use. We walked up the route of the new trail that is currently well marked with stakes and flags. When complete, the trail will have five rest areas, three native stone benches, and two hundred feet of stone wall. There will also be a viewing area with a native stone bench and a sign at the waterfalls. 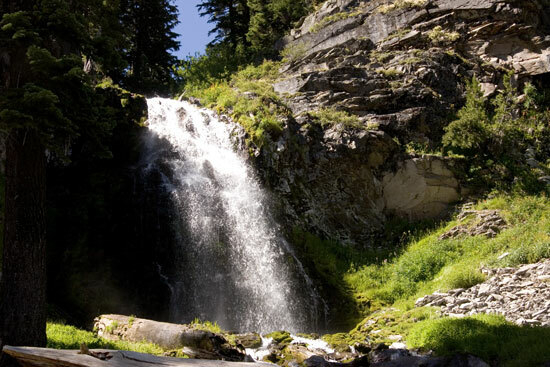 The Park Service named the falls and trail after the Plaikni Band in recognition of the Klamath Tribes’ cultural affiliation with the park and in honor of the people who traditionally used this area. While members of the band may have traveled this far, according to the Oregon Historical Society, the Plaikni Band of the Klamath Tribe had their villages south of the Sprague River a good distance from Crater Lake. Sand Creek begins at Anderson Spring just above Anderson Bluffs and bubbles along about a quarter of a mile before cascading over the cliff to create Plaikni Falls. At the base of the falls Sand Creek continues to cascade out of sight as it flows southward through Kerr Valley then westward through The Pinnacles and out of the Park. The area below the falls is rocky, but filled with a wide array of wildflowers including Scarlet Paintbrush (Castilleja miniata), Lewis Monkey Flower (Mimulus lewisii), Arrowleaf Groundsef (Senecio triangularis) and many more. 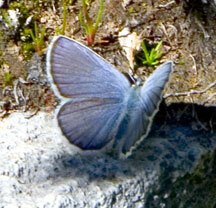 We also saw groups of a small blue butterfly flitting around and being quite congenial. We saw a few of these butterflies on our trek to Stuart Falls, but far fewer than we saw here. This adventure rates highly in the category of scenery because of the waterfall itself and the rocky, foreground views at various points along the trail. The sense of adventure is there as well, but on a trek this short one can’t feel the solitude often found deeper in the wilderness. The variety in the experience is good too. Besides the unique combination of rock and water there are a wide variety of wildflowers and even some butterflies to add interest. History rates low. There is the history of Crater Lake National Park all around, but nothing is interpreted for the explorer. That may change when the interpretive facets of the new trail are installed. The journey offers some interest to kids that will enjoy messing around at the falls and playing in the freezing water at its base. The relatively short trail should also make the destination of interest to kids. Overall, I gave this adventure a rating of 5.0. Butterfly photograph by Patricia Haugen. Chief Scout. All other photography, text, videography and post-production by Jerry Haugen, Pathfinder.